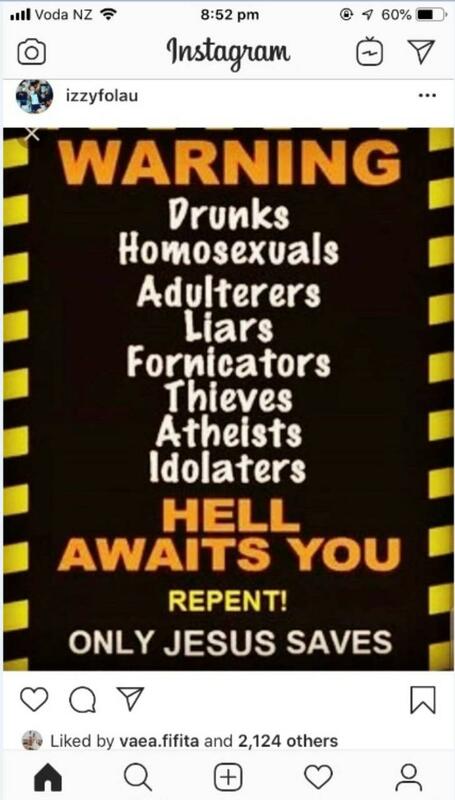 Folau posted on his Instagram page on Wednesday night, claiming Hell awaited "drunks, homosexuals, adulterers, liars, fornicators, thieves, atheists, idolaters" unless they repented. Rugby Australia was very quick to condemn his comments and have now gone one further, as it sharpens its knife for the final cut. "In the absence of compelling mitigating factors, it is our intention to terminate his contract," Rugby Australia and the New South Wales Rugby Union said in a statement on Thursday night. RA chief executive Raelene Castle and NSWRU CEO Andrew Hore confirmed the two bodies had tried repeatedly to contact Folau through Thursday, but he had failed to respond. "Whilst Israel is entitled to his religious beliefs, the way in which he has expressed these beliefs is inconsistent with the values of the sport," said their statement. "Israel has failed to understand that the expectation of him as a Rugby Australia and NSW Waratahs employee is that he cannot share material on social media that condemns, vilifies or discriminate against people on the basis of their sexuality." The statement affirmed that rugby wanted everyone to feel welcome, regardless of race, gender, religion or sexuality. "As a code, we have made it clear to Israel - formally and repeatedly - that any social media posts or commentary that is in any way disrespectful to people because of their sexuality will result in disciplinary action." Earlier on Thursday, major sponsor Qantas joined the chorus for Rugby Australia to reconsider its ties with Folau. Wallabies legend Mark Ella told Newshub he doubted RA had the courage to dump Folau in a World Cup year, but the star's comments began to have serious financial implications that couldn't be ignored. It probably slipped Folau's mind - again - that Qantas chief executive Alan Joyce was openly gay, which probably explained why Rugby Australia was very quick to dismiss Folau's views. "These comments are really disappointing, and clearly don't reflect the spirit of inclusion and diversity that we support," a Qantas statement said. Qantas threatened to withdraw its Wallabies sponsorship 12 months ago, when Folau made very similar comments that reportedly put him on a very short leash with Rugby Australia. Two years ago, Joyce had a lemon meringue pie shoved in his face during a business breakfast in Perth, because he advocated strongly for gay marriage. Joyce lives in Sydney with his Kiwi partner. Meanwhile, Ella demanded RA take a stand against Folau, after taking a soft approach last year. "You feel that the ARU obviously told him what's enclosed in his contract and he can't make statements like this," Ella told Newshub. "It's so sensitive to all communities. "He got away with it the first time. You'd like to think that maybe the ARU might actually stand up and do something - maybe sack him. "I don't think they will. Israel is too valuable to [Wallabies coach] Michael Chieka and I don't think they want to lose him, so they'll probably reprimand him, but probably not with what we all expect." Ella, a first-five who captained Australia during the early 1980s, admitted the Wallabies would struggle to win the World Cup without Folau. "They'll probably play it out until everybody forgets," he told Newshub. "Rugby Australia are not very good at making bold decisions, particularly in reprimanding players. "Something has to be done. The ARU are the custodians of the game in this country and have to make a bold decision - I just don't think they've got the guts to do it." Former All Black Adam Thomson echoed Ella's call, but went a step further, advocating a boycott of Folau's teams.